Jerusalem affairs minister attends meeting with Netanyahu, Putin, says Israel has other means of stopping Iran aside from war. 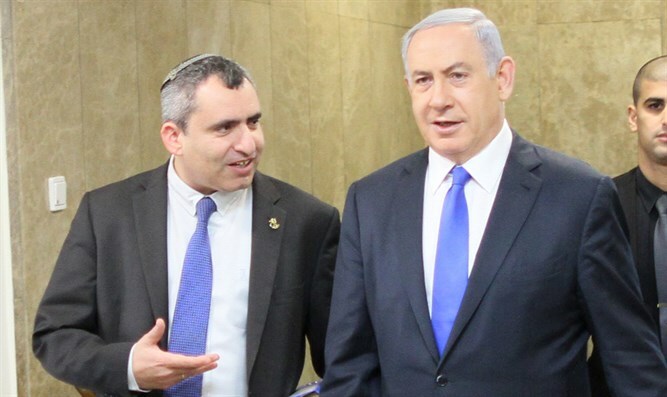 Environmental Protection Minister Ze'ev Elkin (Likud) on Monday morning joined Israeli Prime Minister Binyamin Netanyahu and Russian President Vladimir Putin at a meeting in Moscow to discuss the threat presented by the Hezbollah terror group to Israel, Ynet reported Tuesday. "We have stopped many Iranian attempts to arm Hezbollah from Syria, and now they're trying to do the same in Lebanon," Elkin said. "Just like we knew how to stop them when they worked from Syria, we know how to stop them when they operate out of Lebanon." Elkin also told Ynet that the conversation focused on Iran's efforts to establish a military foothold in Syria, and their attempts to establish missile factories in Lebanon. The talks also dealt with US President Donald Trump's plans to renegotiate the Iran nuclear deal. "Since I began attending these meetings in 2009, everything we've discussed has remained within the four walls of the room. That's one of the reasons why the two leaders (Putin and Netanyahu) have been able to build such an open, direct, and personal relationship. Putin can rely on the fact that nothing will leak." "Neither the Iranians nor the Syrians like the fact that we have managed to retain the status quo in their airspace, despite Russia's presence." Noting Netanyahu's success, Elkin added, "If you had asked me two and a half years ago what the chances Israel would be able to retain critical freedom of movement in those areas, I would have told you the chance was negligible. But it's a fact that Netanyahu has managed to achieve that, time after time, in these meetings." He also said Israel will not necessarily need to fight a third war in Lebanon. "There are a lot of options between doing nothing and starting a third Lebanon war," Elkin said. "Can Israel become trapped in a third Lebanon war? Of course, because at the end of the day, what's facing us is not a country. If Lebanon knew how to manage itself, we would be living in a safer world. Obviously Lebanon isn't interested in fighting with Israel, and was damaged badly in the Second Lebanon War." "At the end of the day, it doesn't depend only on us. It also depends on Hezbollah - in other words, on Iran. At the end of the day, Hezbollah is Iran's long arm."